Volvo builds the XC60 in Ghent, Belgium, and the car has been their best seller since its introduction in 2008. It is a compact crossover SUV that was unveiled at the 2007 North American International Auto Show in Detroit. I tested one this past week both in Denver and in Greeley, and its nimble behavior and horsepower provided a nice way to haul relatives all over the Front Range. Whether it was parking on little side streets in Denver or roaring down to Centennial on I25, the Volvo was a super trouper for the task at hand. We even drove the Swedish product to IKEA to shop for, well, Swedish products. All of us had Swedish meatballs for lunch, as well. Another Swedish outfit produced the hit song “Super Trouper” in 1980, that being the pop music group ABBA, inducted into the Rock and Roll Hall of Fame in 2010. The two married couples that made up ABBA sold over 370 million albums and records worldwide from 1972 to 1982, and in 1999 their collection of work was adapted into the successful musical Mamma Mia! that toured worldwide. I was lucky enough to see Mamma Mia!, which came to Greeley in 2012, and left the show with the catchy beat of “Super Trouper” inbedded in my brain. In typical ABBA fashion, the song is presented as happy and upbeat, yet tinged with a hint of sadness. The Volvos I have driven never have made me sad, and this SC60 was particularly satisfying in daily service (for a week). It was the T6 model with all-wheel drive and six-cylinder in-line power. The engine sits crosswise in the front of the sedan, providing an extra measure of collision safety. A turbocharger on the 3 liter engine brings horsepower to 300 and torque to 325 lb. ft. Transmission is a six-speed automatic with manual shift mode. Acceleration is reportedly zero to sixty in 6.9 seconds and fuel economy ratings are 17-city and 23-highway. I observed just under 19 mpg; the tank holds 18.5 gallons. M.S.R.P. 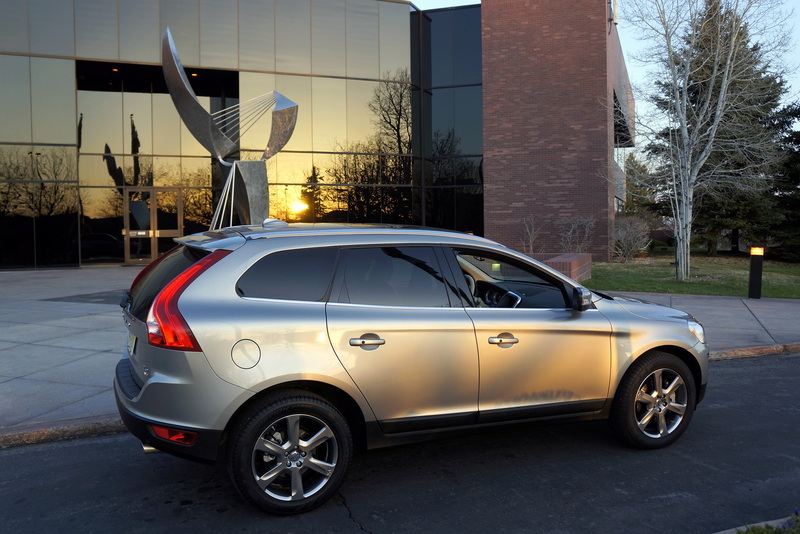 of the XC60 was $48,145, including freight, and options included a Platinum package ($4,600), climate package ($900), metallic paint ($550), and 19″ Fenrir alloy black chrome wheels ($750). The Platinum upgrade included a navigation system, backup camera, premium stereo, power tailgate, parking assist and active Xenon headlamps. The climate package entailed heated front and rear seats as well as heated windshield wiper nozzels. The five-passenger interior was two-toned (brown and beige) leather and included power windows/locks/mirrors, tilt/telescope, satellite radio, USB port, Bluetooth connection and pushbutton starter. The buckets were supportive and back seat passengers registered no complains about the accommodations. Styling of the XC60 is a plus feature of this Volvo with the attractive wheels and roof rails. The panoramic moon roof can be viewed from outside the car and dual chrome exhausts extend from under the rear bumper. Big tall taillights adorn each rear corner of the car and the Seashell gold metallic paint stands out. I’d have no problem driving an XC60 on a permanent basis. This white little Swedish number was waiting for Ruth and I at DIA upon our return from Chicago last week. In Latin, the word Volvo means “I roll”, so we rolled up to Greeley, and I was forced to familiarize myself with the controls in the dark (late arrival). This was my third Volvo to test, and I must say I have liked them all. Volvo was founded in Gothenberg, Sweden, in 1927, and is currently owned by Geely Automobile of China (since 2010). My S60 came in “Ice White”, which was no big deal, but the leather seats were “Beechwood” and black leather, and very attractive. This S60 T5 is the Volvo that comes with an in-line five-cylinder, 2.5 liter alloy engine sitting crosswise under the hood. With the turbocharger, it puts out 250 horsepower and 266 lb. ft. of torque. It’s coupled with the electronically-controlled AWD system from Haldex and a six-speed Geartronic automatic transmission with sport mode. Acceleration of the T5 is reportedly zero to sixty in 6.6 seconds, and fuel economy ratings are 20/city and 29/highway. I observed 23 mpg during my time with the Volvo. The AWD system only sends a trickle of power to the rear wheels when cruising, enhancing fuel economy. But for snow or sporty driving, more power is sent to the rear. The ride and drivability are satisfying for this five-passenger car, as you might expect from Volvo. The AWD system adds $2,000 to the M.S.R.P. of the S60, and I cannot see why someone would buy the car without the option. Other options on this car were the premier package ($2,200), climate package ($700), trunk spoiler ($375), and 17” Njord alloy ten-spoke wheels ($250). The premier equipment included moon roof, key-in-your-pocket ignition, leather seats, and a power passenger seat to go with the power driver’s seat. The base price, freight, and these options brought total list price to $38,170. This Volvo comes standard with Sensus, incorporated into the dashboard’s 7” display as an intuitive computer command system. No navigation or rear camera was present on this Volvo, but it had satellite radio, CD, Bluetooth, and a USB setup. Of course it had power windows, locks, tilt/telescope, and heated front buckets. Additionally, the car had City Safety, a system of frontal collision avoidance utilizing a laser sensor. I did not participate in this program. The styling of Volvo’s S60 is certainly acceptable, and has been reconfigured as of last year. It’s an upgrade from the old S60, and my test car garnered a lot of looks around town and in parking lots. The little spoiler on the trunk was attractive, as were the dual exhausts back there. If I were in the market for a luxury European weather-fighter with classy looks, this Volvo would be on my shopping list, equipped pretty much the same as my test car. Bobby Goldsboro is a well-known singer-songwriter to me, but I didn’t know he was THIS well-known. THIS man had eleven top-40 U. S. Billboard Hot 100 hits, and twelve on the country charts. The Florida native that once played guitar for Roy Orbison broke onto the scene by himself in 1964 with his first big hit, “See the Funny Little Clown”. His biggest hit of all was brought out in 1968, and it was a honey, named “Honey”, his first country hit that reached number one, both here and in Australia. Bobby remained a country music fixture well into the 1980’s. I graduated from high school during the year of 1965 and spent it driving around listening to radio station KOMA in Oklahoma City, where I heard Bobby’s top single that year, “Little Things”. Little things are what I enjoyed about the test car for this past week, the 2012 Volvo XC70 T6 AWD station wagon. Not overwhelming with regards to power or styling, the little (little?) wagon just kind of grows on you while you tool around from place to place. The Volvo has a window sticker that totals $49,070.00 with about $10,000.00 worth of optional equipment. Thus, it has navigation system, great satellite stereo, Bluetooth, tilt/tele, heated seats front and rear, backup camera, turning headlamps, leather throughout, roof rack, moon roof, power tailgate, 18” alloy wheels, blind spot alert, park assist, pushbutton start, ground lighting at the doors, and dual zone climate control. Power is supplied for the Volvo by an in-line 6 cylinder, 3.0 liter, turbocharged alloy engine with 300 hp and 325 lb. ft. of torque. A six-speed Geartronic automatic transmission backs it up and is coupled to an all-wheel drive system. EPA mileage estimates are 17city/23highway, but I got 24.1 mpg on a round trip to Denver. Wheelbase is 110.8” and overall length is 190.5”, with the weight coming in at 4,152 lbs. 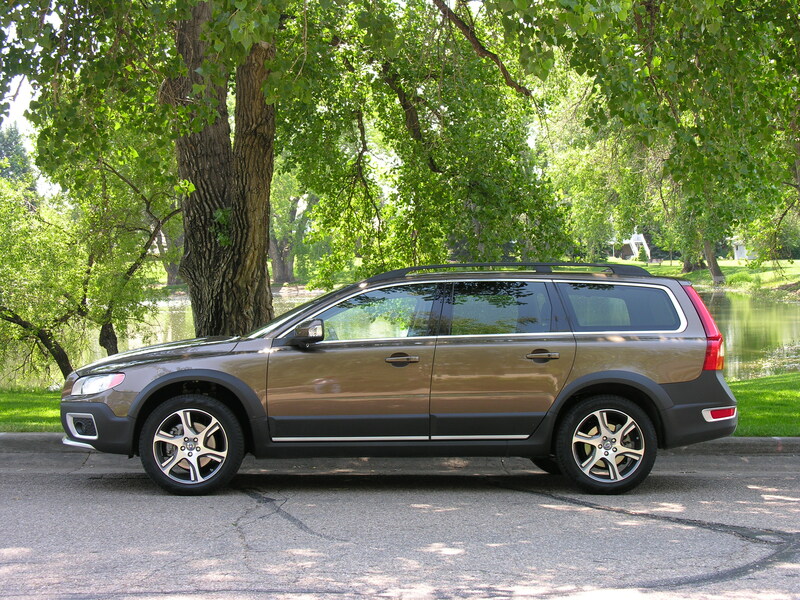 The Volvo I drove came in Twilight Bronze metallic, and coupled with the charcoal cladding all over the wagon, it was an appealing look. Inside the leather seating was chocolate brown, but a lot of almond-colored trim was on hand to give it a splendid look. I counted five colors on the dashboard – the two already mentioned, plus gray, silver, and woodgrain. Dual exhaust finishers peeked out from under the rear bumper, and the roof rack had a massive, functional, look. While in Denver, I loaded the vehicle with five, big hungry holiday diners, and the ride was suitable with all on board. The acceleration of the XC70 is great, reportedly zero to sixty in about seven seconds. And I understand the top speed is 130 mph. What “little things” did I like? -The stitching on those yummy brown leather seats. -The tall taillights affixed at the rear corners of the car. -The cross mounted in-line six providing additional protection in case of a head-on. -The multifunction stalks on each side of the steering wheel. -The Zephyrus 18” alloy wheels. -Rear headrests that flop down at the flip of a switch (on the dashboard) for visibility. -The Xenon headlamps that peek around the corner. I could go on and on. 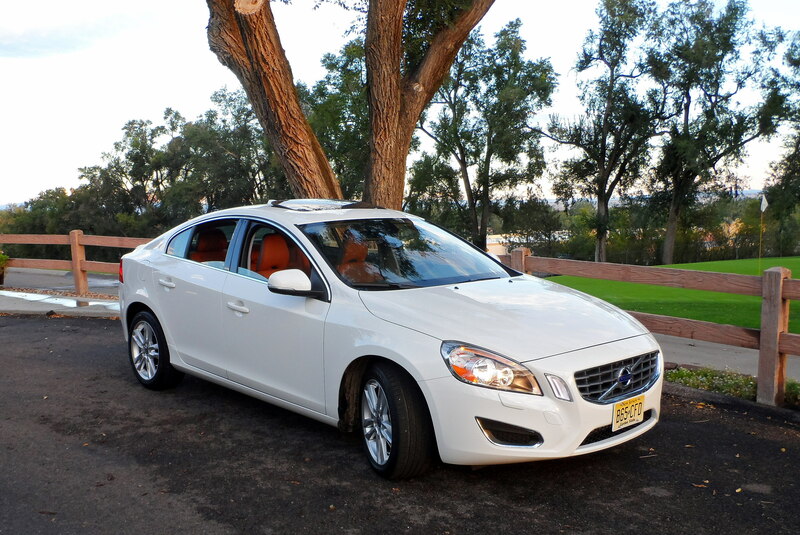 I give the Volvo a thumbs up for the enjoyable week that I had the car. It could provide years of enjoyment for someone, just like Bobby Goldsboro did. 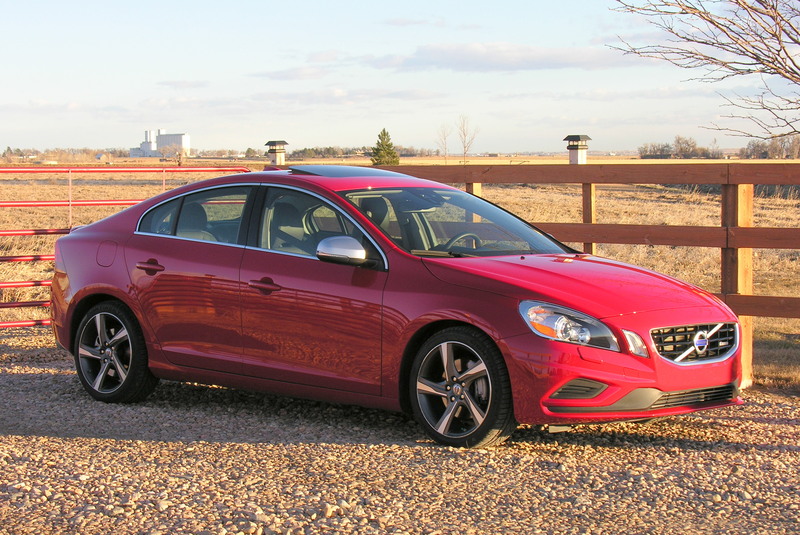 The Italian phrase for “My Goodness” comes to mind as I test the Volvo S60 this past week. It was a Passion Red all wheel drive four door sedan dressed out in the “R Design” configuration, fully loaded. R Design refers to the special front styling, blue watch dial instrument cluster, increased horsepower, tuned suspension, special wheels, dual tailpipes, and trunk tail fin. The 3 liter, 325 horsepower six makes this car the most powerful production Volvo ever, and is an in-line model setting crosswise under the hood of the car, providing a measure of frontal collision safety. It’s turbocharged and provides 354 lb./ft. of torque with a redline of 7,000 rpms. Coupled with a six speed automatic transmission, the zero to sixty and top speed numbers are reportedly 5.3 seconds and 134 governor limited miles per hour. Fuel (premium) numbers are 18/26, and I have noted a readout of 22.7 mpg. The car rides on 18” IXION alloy wheels fitted with 235/40ZR18 Continental Extreme Contact radials. The M.S.R.P of the little Volvo was $46,875.00, including freight. Also included was a Multimedia package ($2,700), and Climate package ($800), the two of which provided premium sound, rear park assist camera, navigation system, heated seats/headlight washers/windshield washer nozzles, and an upgraded interior air quality setup. The R Design elements (see above) were included in the base price of $42,500.00. Inside the car were Offblack leather buckets with double stitching, yummy aluminum inlayed trimwork all over, leather steering wheel with more aluminum, power moon roof, and sporty shift knob and pedals. All the appointments that are to be expected in a loaded sedan are there including a console/stack with buttons I’m still, as of this writing, getting familiar with. I’ll describe two: one to flop the rear headrests down for rear visibility in reverse, and another to activate the rear camera and peek at the plates on that vehicle that’s been tailgating you. I referred to the Volvo as “little” because it’s only a bit over fifteen feet long. It will fit in the garage and you can have a washer/dryer against the wall ahead of it. Wheelbase is the same as a Toyota Camry, however, and the car weighs 3,863 lbs. The engine positioning is the reason for the stubbiness. I don’t care if they installed it upside-down in there, though, because this car flies! And it’s an extremely smooth delivery of the power (quiet, too). I took off for Wellington in the Volvo and found the ride to be firm, but compliant. Steering is very light and responsive, as well. If driving in the dark on winding roads, the Active Bending Xenon dual headlights do an excellent job of lighting the road ahead. I actually don’t know how that all works – maybe chipmunks looking through the grill with a little control stick in their hands. But I liked it. My trip up north didn’t take very long, but long were the looks of people on the road admiring the Volvo with its gleaming red finish and somewhat jaunty, rakish styling. I say, Mamma Mia, what a car! Ironically, a musical by that name is coming to Greeley next month. The play features music by the group ABBA, a bunch of Swedes that happen to have produced a great product. Like Volvo.